It has long been known that laughter is good medicine, but now there is the Laughter Club, the latest in stress-reduction therapy. Derived from yoga and supported by modern science, the Laughter Club is a place where you can go to laugh your stress away. And now it is here in Saskatoon, thanks to Helen Bzdel. Bzdel, a Registered Social Worker, Certified Art Therapist and Mental Health professional, has completed training offered by the World Laughter Tour, Inc., to become a Certified Laughter Leader, as well as training offered through Dr. Kataria's School of Laughter Yoga to become a Certified Laughter Yoga Leader. She was previously the Canadian trainer for World Laughter Tour, Inc., and provided training for Canadians who want to become certified as laughter leaders. With this wealth of knowledge, she has organized the Laffing Out Loud Lafter Club in Saskatoon. People in Laughter Clubs learn a systematic method of chuckles, chortles, giggling and guffawing that promises to help reduce stress, prevent hardening of the attitudes, and contribute to world peace. The laughter routine, designed to make anyone feel better, works without using jokes or comedy to stimulate the laughter. Bzdel says, "There can be many sensitive issues around humour, such as people not getting jokes or being offended by them. So we skip jokes altogether. We laugh with each other, never at each other. At first the laughter exercise routines can seem a bit contrived, but soon peals of genuine happiness-and-health-boosting laughter fill the room." Dr. Kataria, a physician in India originated the laughter club idea in 1995. It was taken up in 1998 by American psychologist and self-proclaimed "Cheerman of The Bored", Steve Wilson, in Columbus, Ohio. Wilson learned the method, which borrows some ideas from yoga, in India, and then he created the World Laughter Tour, Inc., which has introduced itself to North America and several other countries. Therapeutic laughter clubs are becoming popular in workplaces, health clubs, schools and long-term care facilities. According to Wilson, "Laughter Club programs are a valuable option for older adults in retirement communities, senior centers and nursing homes." 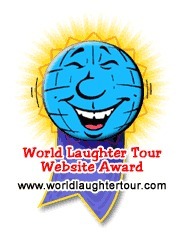 There are now hundreds of laughter clubs in North America and thousands around the world. Wilson has reported that, "World Laughter Tour is now in our nineteenth year and we have trained more than 4,000 Certified Laughter Leaders who, like Bzdel, have completed the college-approved continuing education training, recognized by several professions, including Social Work. Bzdel now joins Laughter Leaders across the world who are showing Canadians how to laugh their way to happiness and health." "This is not only a breakthrough in integrative healing strategies," says Bzdel, "it can be done at work during your coffee break, or even in the backyard, with your neighbours. The most typical reaction to the Laughter Club has been that we need this now more than ever with all of the stress and negativity in our lives and environment." Ongoing research in the science of laughter points to the method's capacity for reducing stress and diminishing social isolation while improving self-confidence and general sense of well-being. World renowned researcher Dr. Lee Berk, at the University of California, reports strong evidence of laughter's role in boosting the immune system and therefore, laughter is likely to aid in preventing some illnesses altogether. According to Bzdel, "Laughter is a universal language, which, in our groups acts as a powerful social and emotional glue. Laughter has no accent. Laughter clubs are open to everyone. You don't even need a sense of humour to gain positive benefits from laughter clubs; just a willingness to relax, have some fun and let go of your tension." Laughter reduces stress and increases endorphins, which are the body's own natural opiates – they make you happy! Therefore, when you laugh, the production of endorphins in your body keeps you feeling good for ages (American Journal of the Medical Sciences). Laughing is a fun new way to exercise. Laughter has many positive benefits such as enjoyable social interaction, improved mood, more positive outlook, and "prevents hardening of the attitudes" (Steve Wilson). For information about therapeutic laughter programs and how to join the local laughter club, the Laffing Out Loud Lafter Club, or to arrange for an interview with Helen Bzdel, call (306) 222-0563 or e-mail her at laffingoutloud@sasktel.net. © 2019 Laffing Out Loud. All Rights Reserved.